While sitting at a stop sign next to a farmer’s field, I saw something I’ve never seen before. A large longhorn steer chewing on a large plastic bag! My first reaction was to laugh out loud – he looked hilarious. But then I thought, Oh no! He’s not supposed to eat that. He’ll be so sick! I decided not to get out of the car to take the bag from him because, well, he was a longhorn steer. I thought about how the event may have played out for the steer. He’s hanging out in the field, enjoying the sunshine and watching the cars drive by. Then suddenly, something new and unexpected drifts into his field. Intrigued, the steer walks over to the bright, shiny bag and picks it up in one quick motion before it can get away. He chews away on the alluring new find, completely unaware of the effects it will have on him later. 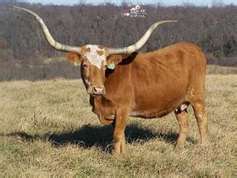 I’ve been that long horn steer. I’ll be going about minding my own business when suddenly something bright and shiny catches my attention. Knowing it’s not normally in my life, curiosity gets the best of me. Before it can get away, I jump at the chance to have it. Blissfully unaware of the effects it can have, I partake in my new distraction. Years ago I had the opportunity to teach a 3 year olds’ class at my church with a dear friend. I was so excited about teaching with her that I didn’t consider if teaching small children was part of my giftedness. I didn’t take long to find out that it wasn’t what I should be doing, but I refused to give up. I spent so many months chewing that bag trying to make it work, I didn’t pay attention to the negative effects it was having on me. My friend interacted effortlessly with the kiddos; it was perfectly natural for her. I, on the other hand, was stressed out and felt cranky all the time because I had to try so hard. Our plastic bags can be a lot of different things: opportunity; temptation; status; achievement; sin. Just because it blew into our yard, doesn’t mean it is good for us. Pride kept me distracted and frustrated even though it seemed like a good thing to do. Trust me, there are tons of good options out there. But God wants us to trust Him to provide the best option for us-and it won’t be a plastic bag! My body tightened up. I frantically looked for ways to escape but it was too late. I had to drive down the rough, bumpy road. If I’d had known, I would have taken a detour. I wouldn’t have bumped and banged my car along the road under repair. I would have gone around it, even if it took a little longer. Do you think that’s why God doesn’t post Rough Road signs? Our bodies would tighten up with apprehension of what lies ahead. We would frantically look for ways to escape. We may even choose a detour taking us far out of our way just to avoid a little discomfort. That’s what I would do, would you? I have a tendency to choose the path of least resistance. But sometimes that’s not where God wants me to go. In fact He uses the rough road to wear down some of my sharp edges. 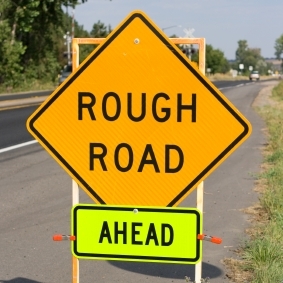 Sometimes a little road construction is exactly what I need! We may ask God to give us direction on big neon signs or with bright flashing lights, but the truth of the matter is we need only follow the path that lies ahead. It can twist and turn, be smooth or rough, but it will always lead us to where He wants us to go. Are you ready for the journey? The day becomes a gift when you receive something unexpected. That’s what happened to me when I checked my blog stats today. I followed a link back from a referral and found a nomination for a blog award. How awesome is that? So many times, we keep doing what we’re doing with no thought of the people we effect–negatively or positively. A good reminder for me to make sure my words and thoughts stay in the right place. 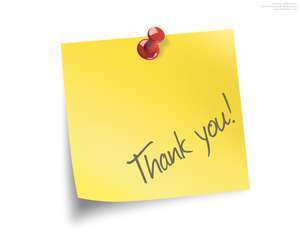 Thank the person who nominated you and create a link back to their blog. 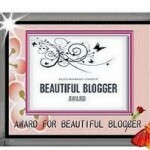 Share the love - Nominate several other bloggers for their own Beautiful Blogger Award. I have another blogger friend I'd like you to meet today. I met Vonda Skelton at the North Texas Christian Writers Conference and found a kindred spirit. We both have a passion for women's ministry, love the written word and enjoy a good story. So today, Vonda most graciously agreed to tell us a story of childhood dreams and God's perfect timing. Grab a cup of coffee, you're gonna love this! As a little girl, I never wanted to do little girl things. Instead of being a cheerleader, I played on the boys’ baseball team. Instead of running from the guys who pulled my hair, I chased them, threw them to the ground and beat them up. Life was good. Then I found Superman. Standing up for truth, justice, and the American way, this muscle-bound hero showed up in my living room every week, protecting the population of Metropolis from the evil forces of the world. He was always there when they needed him. And although I understood that Superman wasn’t real, I still wanted to be like him. I wanted to fly. I don’t mean really fly. I was old enough to realize that some sort of trick made Superman soar above the needy crowd. Then I discovered the secret. They used ropes! So I tied a towel-cape around my shoulders, grabbed a rope, and climbed up my favorite tree. I was very careful to make sure the rope was the correct length, long enough to allow me to soar back and forth over the sandbox, but short enough to assure a satisfactory elevation. I wrapped the corded braid around my waist and tested the knots until I was confident they would hold me up. On the count of five, I took a deep breath and jumped. Have you ever tried to breathe while hanging from a rope? In case you didn’t know, it doesn’t make any difference whether the rope is tied around your waist or around your neck, the end result is the same: you die. So there I was, dangling from the tree, folded in half like a peanut butter and jelly sandwich, the dead weight of my arms and legs hanging over the sandbox. I couldn’t reach the tree and couldn’t squeak out a call for help. For the first time in my young life, I knew real fear. In the few moments it took for my entire life to flash before my eyes (all of about three seconds—it doesn’t take too long to flash through seven years), I realized I was going to die. I had climbed the tree in order to pretend I was saving the world, and now I prayed that someone would come along and save me. I imagined my parents’ reactions when they found my limp body hanging on display, right there in the front yard for all to see. Boy, was I in trouble this time. And then a miracle happened. Daddy came home early. As a hard-working young man trying to support his wife and four kids, he was rarely home before bedtime. But that day, he was. And just as the last three molecules of oxygen were circulating through my brain, Daddy’s big, strong arms reached up and saved me. He took control of my most dangerous situation. That day confirmed what I already knew: Daddy was right up there with Superman. And although he wasn’t faster than a speeding bullet and couldn’t leap tall buildings in a single bound, he was my hero. He had rescued me in the most fearful moment of my young life. If only we would always recognize and tap into the super powers of our Heavenly Daddy. Unlike our earthly father—or Superman—God’s power is never limited. And He wants to be our Hero! Are you at the end of your rope today, hanging on for dear life? Are you fearful? Suffering with illness? Hurt over a broken relationship? Searching for His will in your life? Disappointed in your ministry? Call on your powerful Daddy. Like my daddy was back then, God is constantly at work. But instead of being busy and unavailable like my earthly daddy, God-at-work means He’s always with us. He doesn’t miss a thing. He’s ready and willing to step in and take control…if only we’ll let Him. God’s big, strong arms are ready to reach down and save you. What do you need to release to Him today? Vonda Skelton is the author of four books: a women’s non-fiction, Seeing Through the Lies: Unmasking the Myths Women Believe, and the 3-book Bitsy Burroughs Mysteries for kids 8-13yo. 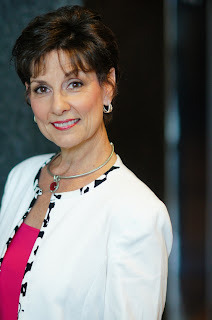 She is also a national speaker and founder of the Christian Communicators Conference (www.ChristianCommunicators.com), which educates, validates, and launches women in a speaking ministry. 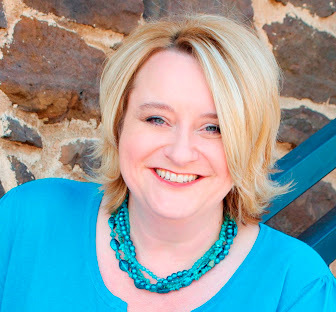 She loves teaching writing through her popular blog, The Christian Writer’s Den , which you can find at her website, www.VondaSkelton.com. Vonda and her husband Gary live in SC, have two daughters and four grandchildren, and have been married all their lives…and they’re still happy about it! Clouds gather. Winds shift. The sky turns a tint of green. There’s a storm brewing. Sometimes we see the storm coming and have time to prepare for it. Other times, we are caught off guard and run for cover. In my home state of Texas, tornado season runs from March until June. 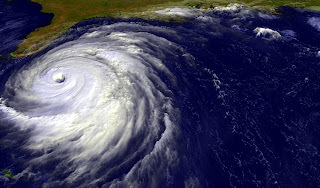 But hurricane season can stretch from June until October. So basically, eight months out of the year conditions will be right for a storm to brew. Those odds may sound overwhelming, but they are nothing compared to the storms of life. We have a chance twelve months of the year to be bombarded by the swirling conditions around us. Again, sometimes we see the storm coming. Other times we don’t. Even the most catastrophic tornadoes and hurricanes have an eye in the center. In the center of that storm there is an unexpected peace. The sky is clear and the winds die down and for a few moments everything is as it should be. Believer, God is in the center of your storm! He’s not watching from the sidelines wondering how it will all turn out. He’s in the middle of it all. He is your peace. He is your constant. You can run to Him and be safe. The One whom the winds and waves obey knows where you are and is there for you. God is for you! The storms of life will come and go but God is constant. There is nothing He can’t protect you from. Bring on the rain.